1. GREAT to see some Oregonian reporting on UP hoops over the last week, including actual game stories! Please keep it up, Oregonian! 2. I absolutely do NOT buy Reveno's excuse for the team's lackluster performance over the past 4 seasons. His argument, as quoted in the article, is that he was pressured to recruit the wrong kind of player, presumably meaning players who were really good at basketball but bad in the classroom. Then those players left the team, causing all sorts of problems. So, let's get specific. What scholarship players have left the program in the past 4 years? Jake Ehlers, Oskars Reinfelds and Dorian Cason. None of those players made significant impacts on the court during their time at UP! Furthermore, losing 3 players to transfer over the course of 4 years -- with none of those players being starters -- is not bad at all, compared with most other schools. This is a red herring of a rationale for the downturn after the '10-'11 season. Quick's article is pretty good, but he didn't do his journalistic due diligence; he took Reveno's argument at face value, rather than investigating who the supposed bad-apple players were. Tempted by success, he strayed from the academic values of the university and stretched his own moral framework. "I was encouraged by administration to get more athletic," Reveno said. "We took kids who weren't the fit on campus that we were looking for. Through that process, we learned. We learned who we are." This must be referring to Cason, Reinfelds and Ehlers, right? In reality, they were not "more athletic" than other Pilots players. This is a ridiculous claim. He had better basketball players, but it came with a price. The tension that can exist on campus between the academic and athletic departments heightened as the new players viewed their scholarship as only an avenue to play basketball. Three players transferred, crippling the depth of his roster and disrupting his recruiting cycle. After the 20-12 season of 2010-11, the Pilots went 7-24, then 11-21." Who are these "better basketball players"? I don't remember them! Certainly not the three who transferred. I doubt that any of them would be starting on this year's team [This year: Reinfelds has played in 9 games at Troy, averaging 3.9 ppg; Cason has played in 3 games at PSU, averging 2.3 ppg; Jake Ehlers disappeared from the basketball universe after playing one season in Division II]. This rationale is completely bogus! As for the disruptions in the recruiting cycle... yes, that is a legitimate problem. But is this more than other programs deal with on a routine basis? AND a side-effect of those disruptions is that we have a senior-laden team this year... which has still been prone to the same inconsistencies and meltdowns as the younger teams of the past three seasons. It also doesn't look too good for Reveno that he comes across in the article as blaming the University administration for his program's struggles. What is the coaching staff's responsibility for success? What have they learned? What mistakes have they corrected? 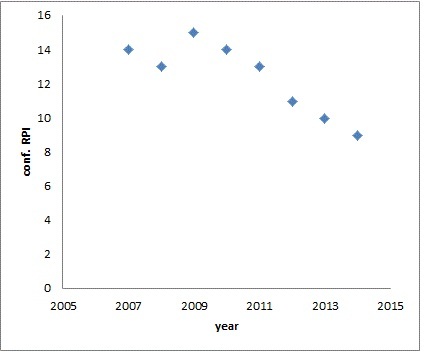 How has their in-game coaching improved over the course of 9 years? There is a lot of great insight in this article about what makes UP a tough coaching job. Personally, I am conflicted about whether or not I think the current staff should stay or go. But Reveno's specific arguments for why the program has regressed over the past four years simply don't add up. So, let's get specific. What scholarship players have left the program in the past 4 years? Jake Ehlers, Oskars Reinfelds and Dorian Cason. This is admittedly a small point, but does no one remember the great wins over Charlie Sitton's OSU team and the Bill Cartwright-led USF Dons. Both were ranked in the top twenty at some point during those seasons in the late 70's. How could I forget! Thanks, Geez. Yes, Tim Douglas also left the program. He was the starting PG at the time of his departure, and therefore clearly left the biggest hole. BUT he still does not fit the picture that Reveno is painting in the article. By all accounts, Douglas is a stand-up guy, an excellent student, and the UP coaches were surprised and disappointed that he decided to leave. Even taking Douglas into account, Rev's story does not add up. I don't think any of the four guys who left the program could accurately be described as superior basketball players who couldn't cut it in the classroom. The actual recruiting problem following the 3-years of success ('08-'09 through '10-'11) was bringing in some players who were inferior basketball players. In addition to those who transferred and went on to achieve very little elsewhere, there have been some players who stayed all four years without making consistent contributions on the court (e.g. Tanner Riley, John Bailey). Other recruits have, of course, been solid players and representatives of the University. But the coaching staff has not been able to turn those guys into a good team. Blaming that on a phantom problem of being pressured by the administration to recruit bad students is really disingenuous. Tim was, and is, an excellent student and young man. I haven't spoken to him in over a year, but last I heard he was on track to eventually enter medical school....how cool is that! NoPoNeighbor wrote: Even taking Douglas into account, Rev's story does not add up. I don't think any of the four guys who left the program could accurately be described as superior basketball players who couldn't cut it in the classroom. You would love to expand the context around the quote and hear the whole conversation that built up to it, but we don't get that opportunity just by reading the article. Three players transferred, crippling the depth of his roster and disrupting his recruiting cycle. After the 20-12 season of 2010-11, the Pilots went 7-24, then 11-21. That's the most misleading/inaccurate line in the article. But that's from the author, not Rev. We know that the depth of the 2011-12 roster was crippled not by transfers, but by the graduation of Sikma, Stohl, Knutson, and Hannibal and the season-ending injury to Barker. I'm not sure how much the 2012-13 record was affected by the transfers of Douglas and Cason, but them leaving sure didn't help matters. OldePilot wrote: This is admittedly a small point, but does no one remember the great wins over Charlie Sitton's OSU team and the Bill Cartwright-led USF Dons. Both were ranked in the top twenty at some point during those seasons in the late 70's. Haha, thanks for the reminder of another win over in OSU. 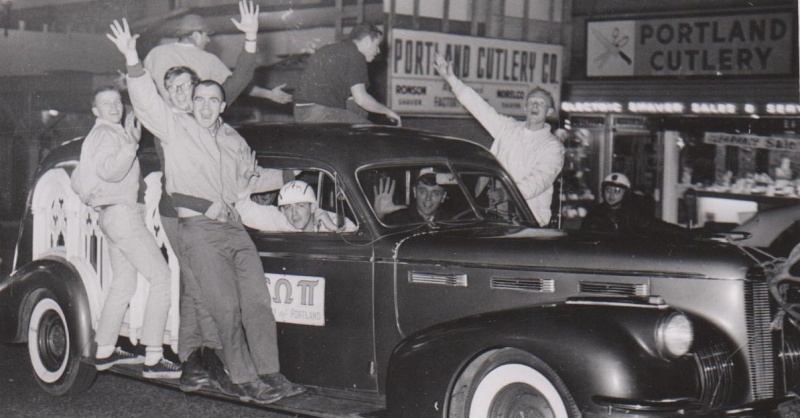 There was a time at UP that Homecoming was a very big deal that involved a huge bonfire and rally on campus and an after dark parade in downtown Portland that included the purple Upsilon Omega Pi hearse. In 1967 the Homecoming theme was, "Dam the Beavers," and the Pilots did, 48-43, at the then very new Memorial Coliseum. Previously the Pilots had lost in Corvallis, 44-64, but the tables were turned in front of a large crowd in Portland. 1967 was Coach Al Negratti's last season as the head coach after 12 years of building the program and progressing from NAIA to D1. The record his final year was pretty bad, and included blow-out losses to UCLA, UO, Seattle U, Gonzaga, Utah St., Vanderbilt, and Pacific....but the Homecoming win over the Beavers was a game to remember. Those were the days, my friend.....notice the look of approval on the face of the Portland motorcycle patrolman. The comments on the oregonlive article are also of interest. I've wondered if Sollars knew where the bodies were buried on the Bluff. Jake is NOT playing for UO, but is enrolled there as a full-time student. Re: Coach Sollars, you are absolutely correct....and he's being inducted into the WCC Hall of Honor on Saturday. Good discussion, especially on NoPoNeighbor's pointing out just whom exactly we got and then subsequently left. Although just because they didn't necessarily pan out elsewhere doesn't mean that UP changed its recruiting tactics to ill effect. Sorry for the formatting, I tried to add a graph but couldn't get it to upload. Here's the source data: NCAA RPI Archive. 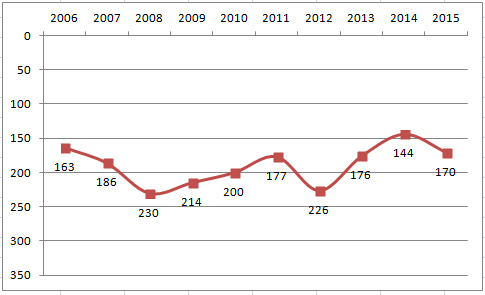 Edit: Should reach #1 RPI by 2021 if the trend starting in 2009 continues. I was thinking about the article last night, and the things that were popping in my head were that Rev was deflecting a lot (which is natural for someone who is fighting for their job), and that the problems mentioned in terms of academics, are not unique to just UP. I know these are not apples to apples comparisons, but other strong academic schools have the same challenges and manage to be successful: Stanford (more so in relation to other Pac-12 schools), Creighton, Notre Dame, Duke, Georgetown, Wake Forest, etc. Clearly those schools have more resources, but they are forced to complete with larger peer schools while balancing academics. Maybe the more appropriate examples are regional universities like Villanova, Butler, Drake, Bradley, Valpo, Xavier, etc. They manage to have success (maybe not sustained in the long term in all cases, but success none the less) and have tough academic standards, too. VillaGorilla wrote: Good discussion, especially on NoPoNeighbor's pointing out just whom exactly we got and then subsequently left. Although just because they didn't necessarily pan out elsewhere doesn't mean that UP changed its recruiting tactics to ill effect. What has been UP's RPI during that same range? I started to figure it out, but don't have the time. I was hoping to make you do it Villa, since you did such on good job on the league RPI. Forget the national scale PN, all of the WCC schools can make an arguement for admittance standards. Living in Spokane I can attest that GU holds their admission department to high standards and things seem to be working out well for them. I have only been following the Pilots for a couple of years, so I bet my point of view is much different than those of you who've been around a while. I just can't stop thinking one thing about this topic... recruiting. If you are a big time recruit who does well in school and stays out of trouble, you probably have your pick of WCC schools. If you are the cream of the crop, realistically you probably go to Gonzaga. If you are the best player of the Mormon faith, you probably go to BYU. So that leaves the Pilots and a ton of California schools. To a high school senior, I just don't think the Bluff has the same draw as California does. I can't believe that weather & setting didn't play a big role in Stacy Davis or Johnny Dee deciding where to sign. With that in mind, I think the Pilots have done a wonderful job of recruiting talent to UofP, and I have to think Coach Reveno has to have played a major role in that. You have a coach that represents your university with class. The kids stay out of trouble and graduate. The team plays hard and are usually in ball games. I think whenever Reveno leaves, we'll truly see how good of a job he's done at holding things together. If he's let go, it doesn't mean things automatically improve. Things could get much worse. Yes, that is the big fear, it could be much worse. And the profile of UP is so low, even in Oregon, that it is not much of a draw. Minor point: Johnny Dee was originally a walk-on, so he's not the best example, but your point re player's choices is still valid. Several local players have gone to California to play in the WCC. I agree that it could be MUCH worse. I question whether it can get much better in the current Administration, Coaching, Alumni and regional apathy environments. I'm not a fan of change for change's sake. I would not want to just go hire another unproven assistant. I would love to see the U step up its commitment, raise & spend some money, and think bigger. 1 year ago, I think most people in Corvallis would have laughed at the thought that a new coach could breathe life into the OSU program and turn it around so quickly... and look what happened. (It was a full house of Beaver fans tonight vs. the Ducks, btw... on a Wednesday, 8pm, televised game in Corvallis). Okay... To be honest, I had no idea about him being a walk on until you told me. That caused me to google it and I learned about the PSU scholarship thing and read that quote. I had no idea about any of that Dang, you guys on this forum are knowledgeable! I didn't know he had an offer from PSU... did he have any others? The article I read said that he had offers from PSU and Montana State. VillaGorilla wrote: This whole discussion, and the topic in general, has left me wanting to see just how much tougher the WCC is now, if it even is. Interpret that as you will. Only fairly consistent thing I've seen is that if a team keeps their Kenpom at about 120/125 - right around UP's basketball budget as compared to the other 351 D1 teams - they're going to be in contention for that 5/6 spot in the conference no matter what the year. No higher, no lower. Excluding Rev's first two years (the cupboard was pretty bare), he's averaged 156, which is right about middle of the pack in the conference. 2012 and 2013 were tough years, but the trend since then has been better. I think the big complaint is that even in 2009-2011 when the teams were good, they didn't have post season success. Hopefully this is the year that changes! I'm a big fan of Reveno. I hope he stays for a long time and finds long term success. So, we want to recruit better student athletes in a conference where higher academic standards are (likey) common at most schools. How do we bring them in? I like the approach football programs are starting to take where they guarantee 4 year scholarships. We could do this, and even consider extending it to 5 or 6 years. The additional years could be used to finish a bachelors degree, a second bachelors, or even a grad program. This would show our commitment to academic and athletics.